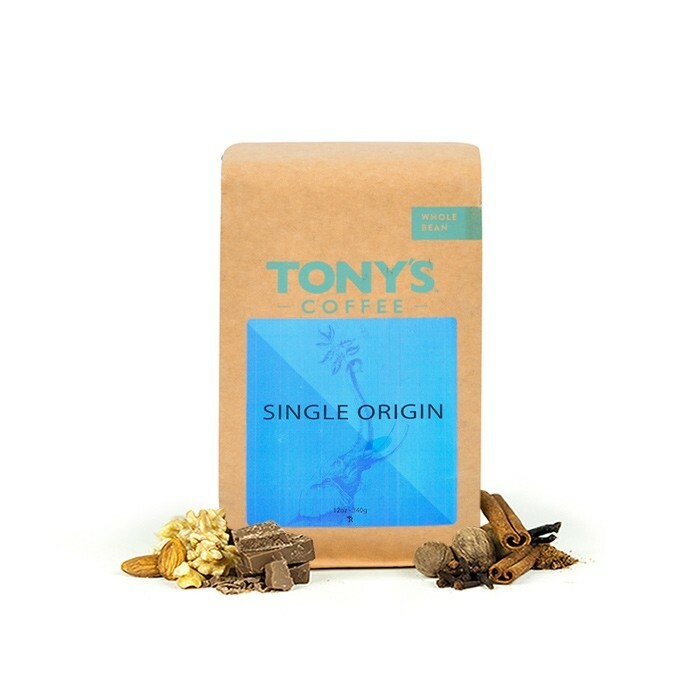 This is the Mexico Chiapas Fair Trade & Organic brought to you by Tony's Coffee. This fully washed coffee was grown by the Union de Ejido y Comunidades San Fernando in the San Fernando, Chiapas region of Mexico between 1,000 - 1,800 meters above sea level. The cup is rich and approachable with notes of cocoa, caramel, and roasted almonds. Great coffee. Loved the body and once I figured out how to brew it, had a great chocolate/cocoa flavor. I want whoe bean please. It took a couple days to get amount right but I got it. Very good rich coffee. Solid cup. The flavor and aroma match the notes on the bag; you get cocoa, caramel, and roasted almonds throughout. It's not over the top. Just a really well balanced cup. This was one of my least favorite cups to drink. I found it to be bitter and heavy on the earthy side. I tried varying water temp, grind size, and brew time with my french press but could not find a winning combination. Not my favorite, make it pour-over style, and find it too strong, or harsh to drink black. Have adjusted the amount of coffee used, cutting back to see if it helped, and it was better. This may be just too strong a coffee for my palate. Not bad. A little on the bitter/sour side. Brewed French press (40 g in 32 oz 200F water) and 25g 12 oz pour over. Gorgeous - tart, rich, bittersweet. love this one. Good flavor at first, enjoyed the almond notes. Lingering bitter aftertaste, over roasted flavor. The bag itself was beautiful, especially inside. Great at the first sip, pure coffee, overlaid with chocolate and caramel under laid with acid to add zing, but the sour, even slight charcoal, aftertaste lingers long after the cup is empty. (Sorry for my inadequate vocabulary--you're obviously not going to hire me to do copy). Although the beans do not appear so, maybe a bit over-roasted? A day or two later, lots more cups and I can't get over the contrast between how good the first sip is and how bitter the aftertaste is. The "almond" flavor must derive from the husks, which are decidedly bitter, so your description is accurate. Not to add more spam, but had time to look at the roast--the bitter aftertaste could easily have come from the roast. Wonder how great the coffee could have been with a lighter roast . . . This one I chose from the coffee list and I think I will go back to letting our terrific curator pick for us! Not our favorite. A bit too earthy and dry tasting for my taste. Hard to find a good balance between underextracting and overextracting, and not very exciting flavor notes. Good coffee but hard to follow the Cafe La Vita. Feels flat instead of rich and round. I love Tony's and this was a great coffee. Very flavorful coffee. Still trying to get the right grind in order to get the best results with a Chemex. Definitely one of my favorites. Love it! Didn't think I'd like a coffee from the Americas this much. Good cup of coffee. Bold. Almonds were apparent. Caramel not as much, but if you used your imagination, you can see what they are saying. I would love something a little more unique/different than this one because it is more in line with what I normally drink(darker, bold, strong). I could be interested in an ethopian coffee or a columbian. I have tried some columbia coffee that was exceptional. Looking for more of a medium blend with relaxing tones for the morning before work. Thank you very much. Loved this! Perfect balance of strong, earthly flavor but also not too acidic. Love this coffee!! Excellent notes of coco and almonds. It's a dark roast, but doesn't leave you with bitter or over roasted flavors. One of my favorites from this site! Rich and approachable indeed. My girlfriend's favourite coffee since this bag was sent to us. Of all the Mexican coffees I've tasted, this one has to be my favorite. Almost like drinking into an almonds Turtle bar. This is an incredible coffee with a rich flavor and subtle hints of cocoa. Although it has a strong flavor, there's no hint of bitterness or off-flavors which makes it a perfect morning cup. Tastes a little more darkly roasted. Wonderfully rich and smooth and sippable. Oily and over roasted. Tasted like cigarette smoke and sadness in a cup. bad taste or over-roasted, can't remember, but would not want again. This might be my favorite one I have received so far. Really good. Loved this one! Smooth and yummy! Too dark, not an enjoyable flavor at all — even to those in the house with darker palettes. Pretty good but nothing really stands out. I think this may be one of my favorites, the roasted almonds is spot on and I'm actually picking up some tobacco notes which I like.